Cruise from Hilton Head to Savannah on this Lowcountry day trip that’s packed with views. Relax on the open-air upper deck or air-conditioned lower cabin as you cruise through the Intracoastal Waterway, drink in hand from the onboard bar (own price). Then, dock in Savannah and spend a few hours of free time shopping, dining, and sightseeing before sailing back to Hilton Head. Views of the lowcountry waterways. A full service bar available for purchase. 1 hour 45 minute travel time to and from Savannah. 4:45pm arrival back to Harbour Town. 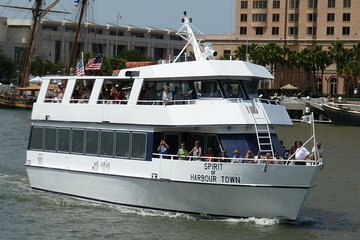 Cruise in comfort aboard Hilton Head Island’s only air-conditioned and heated passenger vessel. The Spirit features comfortable seating inside the island’s only enclosed cabin as well as out on our covered open-air deck. Enjoy coffee, hot chocolate, or your favorite beverage from our full service snack bar. The Spirit makes 23 knots providing a fast, stable ride without the worries of driving and parking in Savannah’s historic district. We had an awesome time both on cruise and tour bus. Both very informative we learned a lot. We would definitely come back.We are from Portage, Indiana. Driving back again the next day to take in more sites.